First, let’s look at how the fob works. The fob contains an RFID type chip, an infrared window, and a radio frequency transmitter. The RFID chip is used when you put the key in the ignition to let the van know that the key is legitimate. The infrared transmitter is not used on the North American Sprinter. 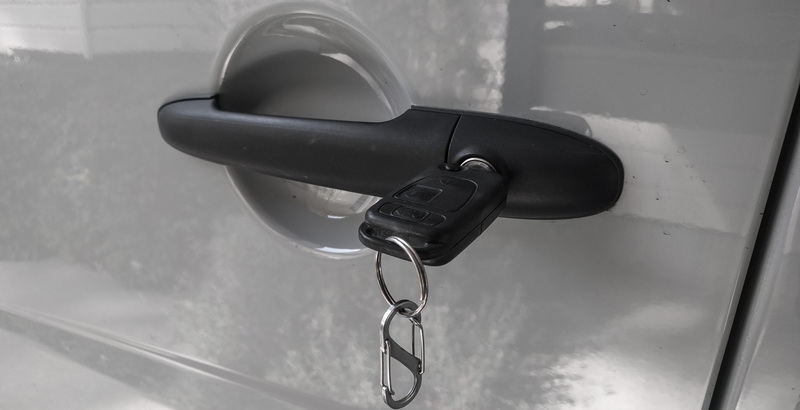 The radio frequency transmitter sends a coded command to the van to lock or unlock the doors. There are three main things that affect fob range. Battery power in the fob, how much stuff is between you and the receiver in the van, and (surprisingly) whether you hold the button down long enough. If you keep your key fob in your pocket or in a bag where the buttons can be pressed, that will wear the fob battery down faster. Each time you press the button the radio frequency transmitter sends a signal. That takes power. As the battery wears down, the amount of power it can provide is reduced, so fob range is reduced too. The Sprinter fob batteries are easy enough to replace. First make sure the key is in the open/released position. Then you can gently pry the lower part of the back of the case off, starting from the side where the key folds away. The fob takes two CR2025 3v lithium batteries. 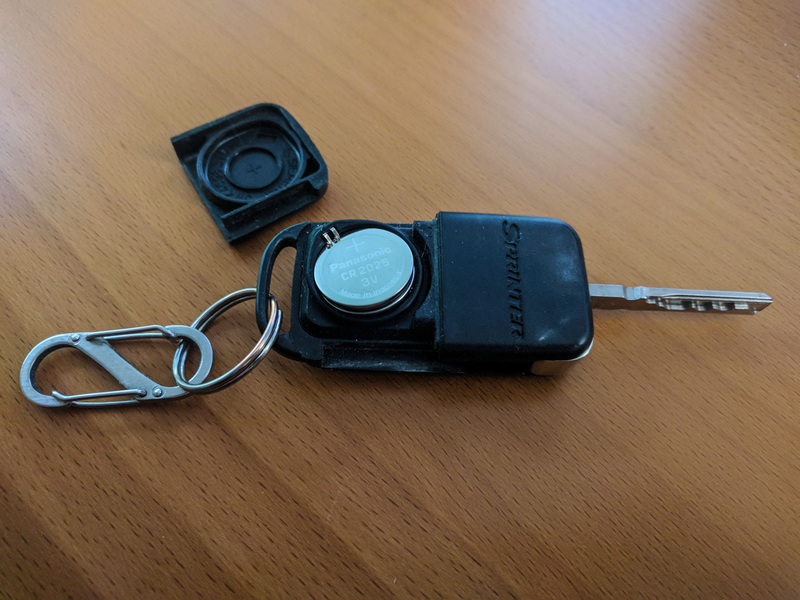 Replacing the sprinter key fob batteries – the cover pries off and there are two CR2025 batteries inside. The remote control receiver antenna for the key fob is behind the instrument cluster inside the dash. It has nothing to do with the radio antenna on the front of the vehicle. Otherwise, how would FedEx’s trucks lock, considering they don’t have radio antennae? Remember that reception isn’t linear. Being two times the distance from the van doesn’t reduce the signal by half, it reduces it by four times (square of the distance). Getting even a little closer will greatly improve reception. If you’ve added insulation – especially sound deadening butyl, Reflectix, Low-E, mylar foil covered window shades, or other foil-faced products – then you’ve added a layer of radio frequency protection too. Just like wearing a foil hat to stop the government from messing with your mind, the foil lining in your van will stop the fob from messing with the receiver. Interestingly, some locations we stop at seem to consistently have terrible fob reception. They tend to be close to cell towers. When we have our cell phone booster on, that seems to reduce our remote distance too. We’re wondering if there’s some issue with the receiver being overwhelmed with signals on a similar frequency to the fob, so it can’t “hear” the fob so well. Pushing the button harder won’t make any difference, even if it makes you feel better. Under that button cover, it’s just an on/off switch. However, if you are having problems with your fob, try pushing the button for a longer period of time. It often needs a longer push rather than just a short tap. The fob has to transmit quite a lot of information to the van. It has to identify itself with a security code, and then send the lock/unlock command. Theoretically this should only take a fraction of a second, but we’ve found that longer presses really help. The van might not get the full message first time, and pressing the button for longer repeats the message. Personally, I wouldn’t want to mess with the van’s security system. First, adding any other way of unlocking the doors increases the attack surface for bad people who want to get in to your van. Second, adding anything aftermarket to Mercedes’ electrical system has a high likelihood of ending in tears. However, there are aftermarket alarm and remote start systems that have very nice two-way remote control fobs or even smartphone control that are designed to integrate with the Sprinter. Compustar and Viper are two brands whose names pop up regularly. Both offer systems with over one mile of range. This issue is annoying, yes, and you’d really think that Mercedes could engineer a remote control that worked reliably at more than 20 feet. But ultimately it’s a first-world type problem. There’s always the possibility of unlocking the door using the piece of metal attached to that plastic fob. You know, manually unlocking is always an option.